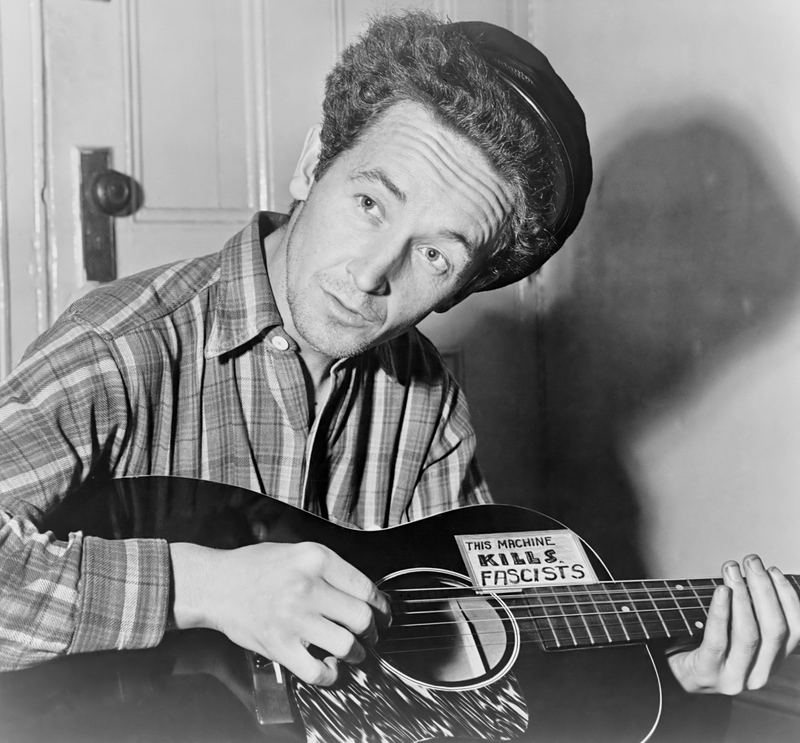 In his 2011 article, “Woody Guthrie’s Social Gospel Roots,” Larry Guthrie (no relation) writes that “Christianity and Catholicism played significant roles in the entire tapestry of the life of Woody Guthrie.” The article points to the legendary American folk singer and songwriter’s first marriage in 1933 to Pampa, Tex., native Mary Esta Lee Jennings, who was Roman Catholic. There were nuns in Jennings’ family, and her brother, Matt, may have introduced Guthrie to the Catholic periodical Our Sunday Visitor and its focus on social justice. The occasion for the panel was the 50th Anniversary of Guthrie’s death on Oct. 3, 1967, and the release of a new box set out now on Bear Family Records, “Woody Guthrie: The Tribute Concerts.” It includes for the first time the entire tribute concerts performed in Guthrie’s honor at Carnegie Hall in New York on Jan. 20, 1968 and the Hollywood Bowl in Los Angeles on Sept. 12, 1970. Along with material originally released in 1972, the new Bear Family box set features 20 unreleased songs from the Carnegie Hall shows, along with bonus interviews, essays and a treasure trove of concert stills, handwritten lyrics, concert programs, a Guthrie discography, a bibliography and more. Bob Dylan, center, performs with drummer Levon Helm, left, Rick Danko, second left, and Robbie Robertson of The Band at Carnegie Hall in New York City on Jan. 20, 1968. The concert was part of a benefit tribute to the late folk singer-songwriter Woody Guthrie (AP Photo). Among the younger devotees Wilentz mentions were some of the biggest folk and pop music stars of the day, including Bob Dylan with members of The Band, Judy Collins, Richie Havens, Odetta, Pete Seeger, Joan Baez, Tom Paxton, Arlo Guthrie, Ramblin’ Jack Elliott, Country Joe McDonald and even Ry Cooder, performing as a member of the house band at the Hollywood Bowl concert. While a wide range of Guthrie’s catalog was revived in the concerts, songs that focused on social issues were often the most powerful, especially those involving migrant workers. Dylan appears toward the end of the show, in his first public appearance since a devastating motorcycle accident two years earlier sent him woodshedding in Woodstock, N.Y, with members of The Band. Among his three songs is “Ain’t Got No Home.” It is a completely different version than the more traditional folk version that Seeger and Arlo Guthrie deliver in Los Angeles two years later. Dylan’s rendition, as befits that period of his career, is loose and rambling, but also defiant and potentially anthemic. He never hid his deep admiration for Guthrie, but also made it clear when he went electric in 1965 that he was not going to be boxed in as a traditional folk singer. But the artists were not deterred. Both the New York and Los Angeles shows opened with the hopeful Guthrie composition, “This Train is Bound for Glory,” and closed with “This Land is Your Land,” probably the most misunderstood patriotic song in the American song canon after Bruce Springsteen’s “Born in the U.S.A.” Guthrie wrote the song in 1940 as a response to the popular Irving Berlin song, “God Bless America,” which he found trite; hence the aforementioned original title, “God Blessed America.” God may have blessed us, but we still needed to take care of each other. This Land was made for Me. It was a powerful song when it was first recorded in 1944, and again when it was played at these concerts in 1968 and 1970, and again when it started showing up at anti-Trump rallies in 2016 and 2017. As America turns inward and towards intolerance, these shows remind us that there have been times like this before. Woody and his family learned the hard lessons in the Dust Bowl years, about oppression and scapegoating. Fighting back, using the power of words, music and community became his life’s work. These performances and songs are as meaningful today, as they were the night they were recorded some fifty years ago. On the website of This Land Press, there is a store where you can buy a “This Machine Kills Fascists” sticker along with other items referencing Guthrie and other Oklahoman icons. One of those items is a Woody Guthrie candle that portrays Guthrie saint-like, in an homage to many of the saint candles we often see honoring The Virgin of Guadalupe or San Judas Tadeo. The Guthrie candle is symbolic, of course, but venerating him and what he stood for, like those artists did in 1968 and 1970, is not a bad idea. Of the many items on the site, it is currently the only one sold out. Were the issue opened for discussion, debate and a vote, my choice for a national anthem would be "This Land is Your Land". The Star Spangled Banner celebrates a flag and a moment in our early history. This Land celebrates our country and its people and remains as pertinent today as when Woody first sang it. And its history gives us the option of changing lyrics, adding verses, in a way that should keep it ever living, ever speaking to new generations of Americans.